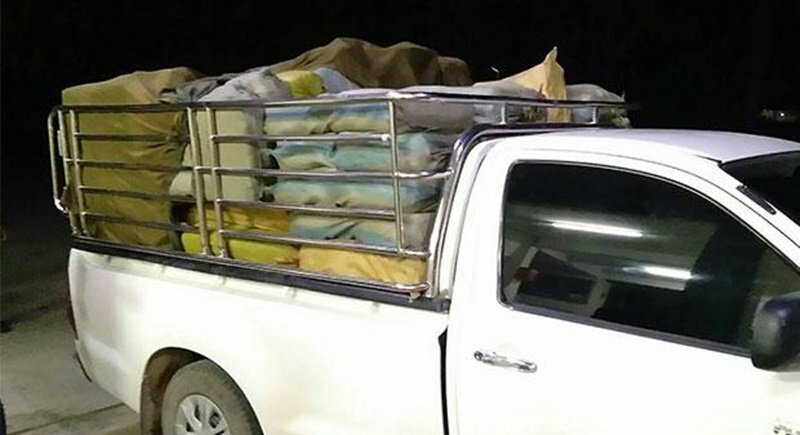 CHIANG RAI: A cargo of 9.4 million methamphetamine pills (ya bah) and 788 kilograms of crystal meth (ya ice) was found on the back of pickup truck after the driver abandoned it and fled near the Mekong River in Wiang Kaen district late yesterday night (Apr 2). A team of soldiers and police led by the Pha Muang military task force spotted the white Toyota pickup, a tarpaulin covering its cargo, travelling on Huay Luek-Wiang Kaen road along the Mekong River around 11pm. As the team moved in to halt the vehicle the driver quickly stopped it and ran off. Underneath the tarpaulin they found 47 fertiliser sacks containing 9.4mn ya bah pills and 788kg of ya ice hidden in tea packets. Authorities said the drugs were worth around B1.7 billion on the street. The truck had Bangkok licence plates. A search was launched for the fleeing driver along his likely escape route. Two other pickup trucks, with Phayao and Chiang Rai licence plates, were stopped along the way and the three men in them held for questioning.